Your boy is growing up fast. Just look at how quickly he outgrows his clothes! Ten years from now, he'll be 16 or 17 years old. Wow! As he is growing, you can give him something that can help him develop self-assurance as he builds respect for other people. And he and you will both have fun doing it. This adventure with him begins with Tiger Cubs - a program of exciting indoor and outdoor activities just right for a boy who is in first grade and/or is 7 years old. You are there with him as his support and guide, but you don't do things for him. He will learn by doing things himself. And as he learns and grows, your relationship with him will grow, too. At the end of the school year, he will graduate into a Wolf Cub Scout den. Later, he will be in a Bear den, and then he'll become a Webelos Scout. 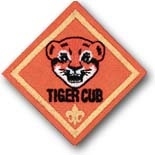 Den meeting plans are developed around a Scouting program year that is presumed to begin in early September and continue through May, at which time Cub Scouts would become involved in summertime Scouting activities. To learn more about these, plus have access to worksheets, downloads, etc., Click Here. Before Earning The Tiger Cub Rank, The Bobcat Badge must first be earned. At a family meal, have each family member take turns telling the others one thing that happened to him or her that day. Remember to practice being a good listener while you wait for your turn to talk. 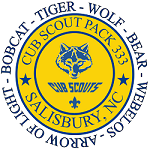 Blue Cub Scout Uniform shirt (See Uniform Patch Placement).